Slate has been a valuable building material for centuries. The natural stone lasts forever and will stay beautiful for as long as you like. Outdoor slate tile adds richness to any exterior setting and is an ideal choice for many walkable surfaces. From a wide selection of colors, patterns, and textures, homeowners choose quality slate tiles for patios and walkways to bring a natural charm and a real outdoor ambiance to any setting. Nature produces slate in an infinite variety of unique patterns and colors. Slate evolved from shale-type sedimentary rock consisting of clay or volcanic ash that, over thousands of years, changed into the finely grained metamorphic stone that we value today. Slate is quarried or mined in many different countries, each one yielding different shades and patterns. As a result, slate is variable depending upon the source of the stone. These groups provide different texture and color, shape, and size combinations to match your preference. Within each tile group, several colors are available. Each selection provides one-of-a-kind groupings of compatible and complementary shades to create unique and attractive patterns. Field tile, for example, comes in 25 different style groups ranging from China Black to California Gold to Indian Multicolor to Mountain Purple and True Red. Simply put, slate walkways and patios can be used to match the look of any outdoor décor and building material. When choosing a color range of slate tile, it is important to note that the movement of the sun will seem to change the perceived shade of the slate. Homeowners and builders should test samples of slate tile in the planned location to determine what effect this may have on the appearance of the tile. Slate tile styles may be cut into varying diameters and shapes. Just as crucial as the color selection, the size and shape of the tile must be compatible with adjacent materials. 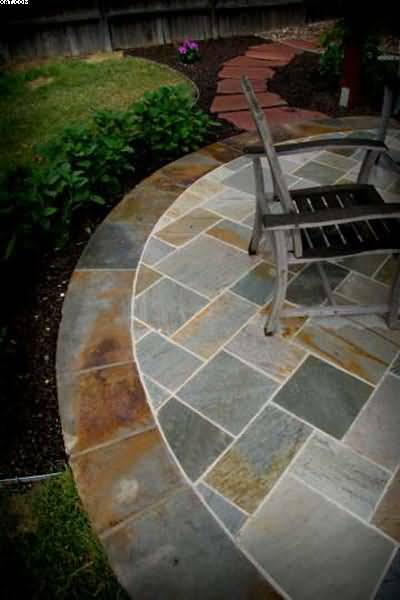 Slate tile is not only a beautiful and long-lasting, but it is a practical choice for exterior walkways and patios. The natural unevenness created by the material’s ridges and bumpiness yield a non-slip surface, essential in wet or rainy regions as well as entries and walkways. PetraSlate Tile & Stone has been a leader in natural stone tiles, veneers, roofing material, and accessories for over 25 years. The experts in global stone and tile materials, PetraSlate represents some of the leading producers in the world. Visit the PetraSlate website for information about natural outdoor slate tile or other products. Or, phone the experts at PetraSlate Stone & Tile at (303)-280-9595.